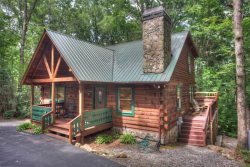 Relax and unwind while taking a leisurely soak in the Hot Tub and listening to the gentle sounds of the waterfalls at this wonderful pet friendly creek side cabin, Amy's Creek 2! This charming and cozy 2 bedroom, 2 bath mountain cabin offers a wonderful escape that's perfect for couples, families, and even Fido. Amy’s Creek 2 is pet friendly, offering the best in creek side getaways. You'll have all the comforts of home at Amy's Creek 2! The newly replaced entrance ramp at Amy's Creek 2 is perfect for those who need an easy access cabin with little or no stairs to the main level. The main floor at Amy's Creek 2 includes the master bedroom, living area with flat screen TV and fireplace, kitchen, full bath and dining table that accommodates 6. Amy's Creek 2 is cozy, comfortable and is a great choice for small families, or two couples. And, of course, Amy's Creek 1 can be reserved as well for larger families or friends! From the wood-burning fireplace to the covered back porch with oversized deck, to the new fire pit and seating with beautiful creek views with two cascading waterfalls, Amy's Creek 2 is the perfect spot to unwind and enjoy the great outdoors. Amy's Creek 2 is a convenient 7 miles to Alpine Helen GA with its many attractions and events, and just 4 miles to Sautee with restaurants, shops and the village market. For larger groups, Amy's Creek 1 and 2 can be reserved together to accommodate up to 11 guests! 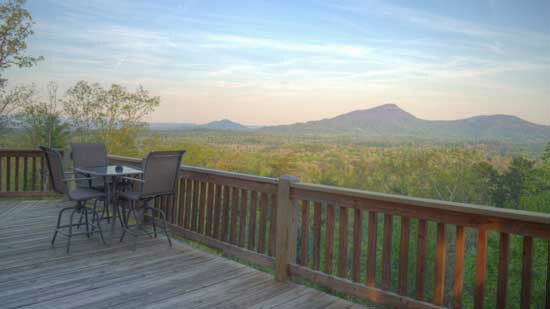 When reserved as a group, both cabins can enjoy gatherings around the large fire pit, while enjoying their own space! • Gravel road and driveway, gentle inclines, accommodates up to 3 vehicles. Amy's Creek 2 is approx 7 miles from Helen! I spoke to Kelly....she was very helpful and nice. This by far exceeded what I imagined! Very beautiful!!! I appreciate the staff for following up to make sure my trip was a success. We enjoyed your quaint little cabin in the woods.We hope to return in the fall. No problems. The staff was friendly and helpful. The location was great, centrally located to Helen, various waterfalls, hiking trails, and many other interesting getaways. Thank you so much for sharing your beautiful location with us. This was our first family vacation in a long time and our first time renting a vacation property. We are already planning our trip for next year! We had a great time! The cabin and location are both wonderful! We enjoyed our stay! Calls were answered quickly, office staff was very helpful, and the young man that came out to fix the TV was very nice and helpful. we will use pinnacle again. It was awesome.I'm looking forward to visiting again in the near future. A quick phone call answered all questions. Pinnacle is a great rental organization. The website was comprehensive, allowing me to make location and housing decisions easily. We were thankful for pet friendly rentals. I was New at the experience and the Customer Service lady walked me through everything without making me feel inadequate. We loved this cabin. Our family of 6 plus a dog were very comfortable. We had 2 vehicles with plenty of space to park. We spent a lot of time on the deck and at the creek. We cooked on the grill every night and just had good family bonding time. We did go into helen and had a great time there also. I've been to helen many times in the past. And have always loved it. It was wonderful being able to bring our dog this time. And he thoroughly enjoyed himself. We will definitely book again. Team was excellent at answering all of my questions. Everyone was very friendly and prompt with communication. Booking was very simple and user friendly online! We enjoyed our time at our cabin very much. Beautiful cabin in a beautiful location. Your staff was wonderful. Directions that were sent were great. I especially appreciated the offer to purchase firewood and have it delivered to the cabin. Definitely a plus. The view was amazing. We could hear the stream while laying in bed at night. Relaxing by the fireplace, on the deck and in the hot tub made our stay extremely pleasant. I had wonderful experiences with the staff. They are friendly and very knowledgeable. Our family throughly enjoyed our trip and will be visiting again.